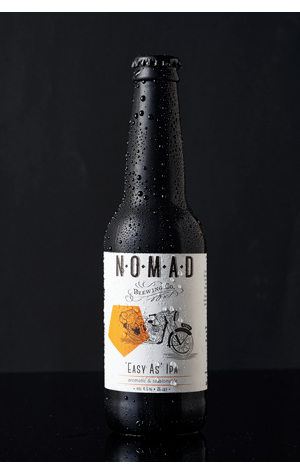 Nomad Brewing continues to build its roster of hoppy pale ales. Into a lineup that starts with the Sideways Pale at 4.0 percent ABV, continues with the 4.8 percent ABV Cruisin' Ale and, in terms of year round brews at least, tops out with the Jet Lag IPA, comes the Easy As IPA. The Brookvale brewery's entry into the "session IPA" arena is a beer that, at 4.5 percent ABV, sits around the lower end of the booze scale for a contemporary Aussie brewed pale ale, but records a bitterness level that places it closer to IPA territory. Pouring a vibrant orange, its fruity aroma offers up mandarin, peach and nectarine. There's a touch of light caramel sweetness to taste, but for the main part this is about the hops, adding a distinctly bitey bitterness that's part bitter citrus marmalade, part resin and has its sights set on those who love to give their palate a workout.